I went to the Yankees game on Memorial Day, which was the first time this season I got an All-Star ballot. As usual, I rode the fence between the players with the best performances and my favorite players. Let's take a look at which chads I punched out on the Subway back to Manhattan. This side of the ballot is completely irrational and indifensible, when considering the neglect of Albert Pujols and Ryan Braun. 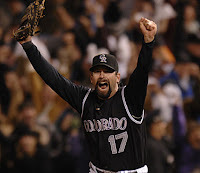 I mean Todd Helton is having a terrible season. Hopefully, he'll rebound and have a good rest of the season. We're hoping for a .380 OBP and double-digit homeruns. 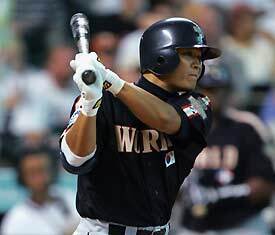 Shin Soo-Choo reminds me of my Portland Beavers days of 2006, when he played with the Tacoma Rainiers. That year, he batted .320 with a .888 OPS, 13 HR's and and 26 stolen bases, in only 94 games. Teammate Adam Jones got most of the attention that summer, but Choo has proven to have established himself in the Major Leagues, while Jones struggles for consistency. The Indians front office deserves a lot of credit for getting him in a trade for Ben Broussard - another less than stellar moment for ex-Mariners GM, Bill Bavasi.